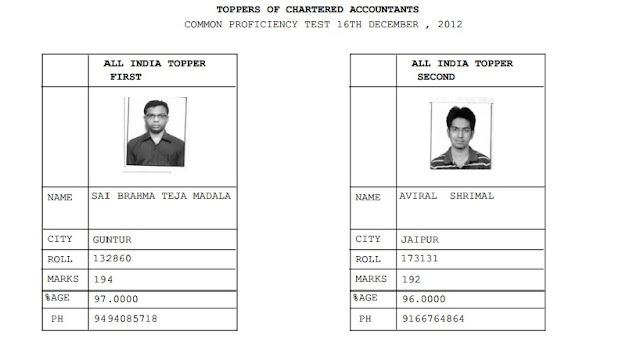 ICAI on 21st of January declared the results of CPT and CA Final. We are presenting the result statistics and details of toppers. It was an otherwise typical Monday for 25-year-old Prema Jayakumar: work, followed by teaching her third year Bachelor of Commerce (BCom) students. Then, at noon, a phone call from G. Ramaswamy, former president of the Institute of Chartered Accountants of India, changed her life. The results of the chartered accountancy (CA) examinations that Prema and her younger brother, 22-year-old Dhanraj, had been expecting were a big deal, but both siblings knew that they would clear the highly competitive exam; they had been working hard for it. For Prema’s parents, auto-rickshaw driver Jayakumar Perumal and home-maker Lingammal Jayakumar, the exam was one of a succession of academic hoops that their daughter had been negotiating with ease for years. But no one in the family guessed that Prema would score 607 out of 800, the highest in the country, and become an overnight celebrity. For Prema, however, the limelight is a distraction from her real purpose: to establish a firm economic foothold for her family, who moved to Mumbai from Tamil Nadu around 20 years ago, and, perhaps, to work for the Reserve Bank of India one day. Prema’s father seems overwhelmed by his daughter’s success; at a loss for words except to repeat how happy she has made him. The family is fluent in Hindi and Marathi, but sticks to Tamil whenever possible. Perumal, from Sankarapuram in Villupuram district in Tamil Nadu, first moved to Mumbai in the early 1990s and took a job at a mill, before becoming an auto-rickshaw driver, plying a hired vehicle. In 1994, Perumal got his rickshaw licence and bought his own vehicle, leading to a substantial saving. When things got tough, he sold a patch of land the family owned in their native village. For a while, Prema’s mother worked at a factory that manufactured hair clips in Vasai, but left the job four years ago for health reasons. The family was not well off and all of Perumal’s three children, two daughters and a son, attended local government schools. 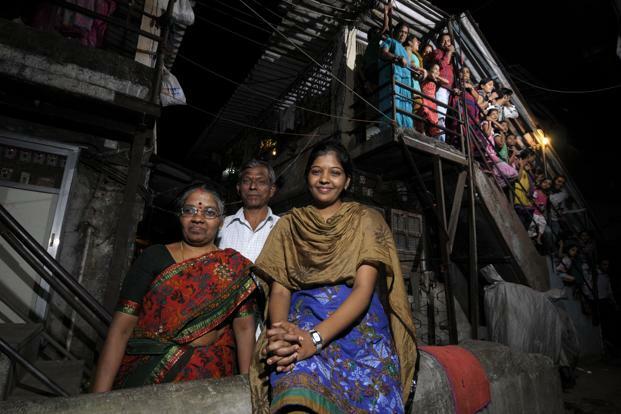 The eldest—Mahalaxmi—at 26, is married with two children. But Prema, the middle sibling, was focused on academics from the beginning. Prema was marked out as a particularly sharp student in 2008, when she was ranked second in Mumbai University’s bachelor of commerce exam, and decided to take up chartered accountancy. She convinced Dhanraj to follow in her footsteps and enrol for the exams at the same time. Studying for the CA examinations is something of a lifestyle choice. Every year more than 30,000 students sit for these exams and less than 15% make it through. It’s a highly competitive course with three levels—the common proficiency test (CPT) , the integrated professional competence course (IPCC) and the CA final. Prema passed all three in one go. She decided on accountancy after graduation, and took a masters of commerce course alongside it. At the same time, she was doing her articleship, a compulsory three-year internship as part of the CA course, at Keshub Shaith and Co. in Borivali. She taught the third-year BCom students in the afternoons, travelling all over the city for her tuitions. Both siblings agreed it was a tough task. They started studying full-time seven months before the CA final exams held in November last year. “We used to start studying at morning 7.30 and end at 11 in the night, almost the whole day, sometimes even more. Proper breaks used to be only limited to Sundays,” Dhanraj said. The usual fee for such classes is Rs.50,000 for the inter IPCC level, she said, far more than her father could have afforded, and more for the CA final. Then, getting second rank at Mumbai University for her BCom exams got her a full scholarship from her tuition for both CA levels—inter and final. Her new-found fame has reflected on the college in which Prema and Dhanraj studied—Nagindas Khandwala College of Commerce, Arts and Management in Malad. Both the principal and vice principal called up to congratulate her, she said. Younger students called her for help and advice. The house is filled with proud neighbours, juniors from college, friends of friends. Their immediate neighbour, a Gujarati family, with whose children the Perumals have grown up, crowd around like an extended family. But her ultimate goal is as fixed as it was before the results came out. “I love the banking sector. CA firms don’t interest me. Banking is what I want to do.” Her father, however, is sceptical of her suggestion that he rest at home. He doesn’t know how, he says, he could sit and not do anything.